Known for his role as the lead singer of Mi Casa, host of My Kitchen Rules, Something’s Cooking and What's for Dinner, cookbook author AND restaurateur... J’Something can now add owning a gin brand to that impressive list. 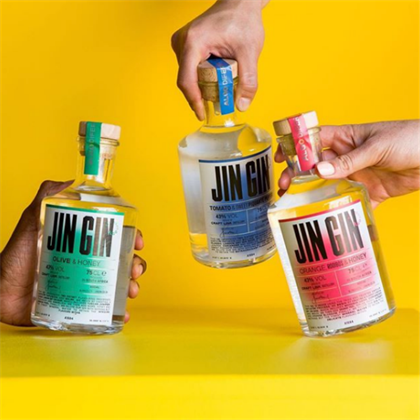 Jin Gin is a spirit that blends one part of J and two parts of his culture and story. The brand aims to offer a high-quality gin to the market that boasts local South African flavours with J’Something’s Portuguese roots. The gin, produced by Craft Link comes in three flavours; olive and honey, orange, rooibos and honey and tomato and sweet piquant peppers, with all three having its own unique meaning. You can find the gin at selected Pick n Pay liquor stores and Ultra bottle stores for R390 per bottle. We definitely have our eyes on this Gin to try this Summer, how about you? Let us know in the comments. Ryan Reynolds' gin is taken to new heights by Virgin Atlantic Airlines. (image: Virgin Atlantic Instagram) ALSO READ: How to master your own at-home gin tasting. Aviation American Gin , is the highest rated gin in the world according to Wine Enthusiast Magazine , despite the brand's young age of only 12 years.